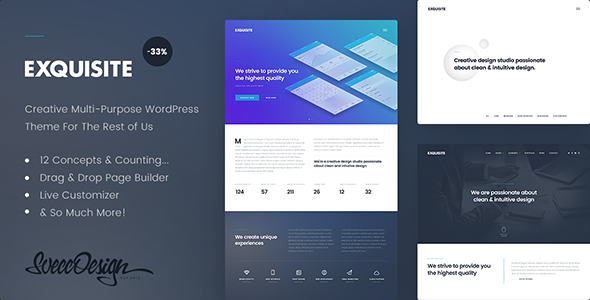 Whether you are launching a corporate website, agency, portfolio, magazine, landing page, or if you have a totally different concept in mind, Exquisite is the perfect theme for your needs. Be amazed how quickly and easily you can build your amazing new website without touching a single line of code. The integration with the most popular drag and drop page builder plugin Visual Composer ($34 worth) and our custom components for it, you can create your own stunning layouts in seconds. Exquisite is responsive and retina ready to make sure your site will look razer-sharp on every devices whether itâ€™s a desktop, tablet or a phone. Thanks to the live customizer, you can change the colors, fonts, styles, layouts and see the results instantly. Exquisite is well documented and weâ€™re always here to help you out if youâ€™re stuck. If you like the theme and want to support us, please give it a rating. It would be much appreciated!